When the roads are wet there’s a higher chance for car accidents. Stopping distance is lengthened and people can find that their vehicles slide more easily, as well. Because of the increased risk, driving more carefully is important. You can’t control what other drivers do, but there are ways you can reduce your risk of getting into a car accident simply by making some different choices. What can you do to stay safe in wet weather? 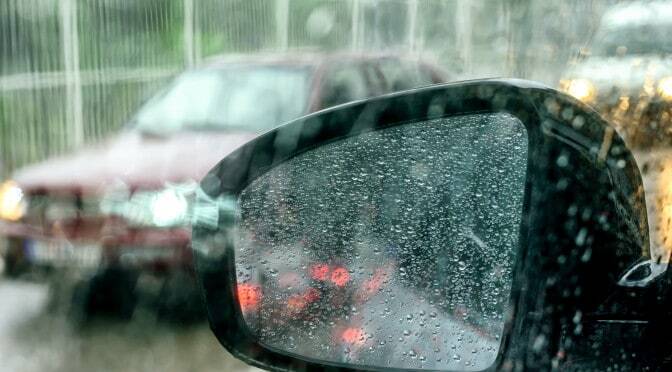 Here are some tips to help reduce your risk of a car accident when the roads are wet. Driving slower can help during wet weather, because it reduces your chances of sliding off the road, not being able to stop in time, or otherwise getting involved in an accident. A lot of people don’t slow down in the rain, but doing so could protect your car and potentially save your life. By not following the car in front of you too closely, you give yourself more time to stop. When roads and tires are wet your car simply cannot stop as fast as it otherwise would, so having those extra few seconds of following distance can really make a difference. Don’t wait until you’re right up on the person in front of you before hitting your brakes.If you have to brake very hard you can raise the risk of your vehicle sliding. Even though most cars have antilock brakes today, these aren’t foolproof. You could still end up with a problem if you try to stop too fast or too aggressively, even if your car doesn’t slide. Swerving to avoid someone, moving the wheel too quickly, or accelerating or braking too hard can all become more dangerous when there is water on the road. Rather than risk it, don’t make any sudden movements. Unless you truly have to do something drastic in an effort to avoid an accident, it’s better to make slower, more deliberate movements that aren’t as likely to result in a high risk of injury. Leaving early when the roads are wet can make a huge difference in your level of safety. By giving yourself those few extra minutes you can drive more slowly, be more careful about your actions, and give other drivers a little more room on the road. That way, even if someone else is doing something dangerous, you can let them get ahead of you so you won’t be at as much risk of an accident. If you do end up in a car accident caused by another driver on wet roads, working with an Irving, TX-based attorney like Geoffrey Dashner can help you recover damages and receive fair compensation for your injuries. It’s better to avoid an accident, of course, but you don’t always have that choice.